A recent article in the Sydney Morning Herald contended that Kevin Rudd’s experiences as a junior secondary school student at Brisbane’s Marist College Ashgrove in the early 1970s could have been responsible for his move away from Catholicism to Anglican worship and shaped his politics. It has been suggested Rudd likes to gloss over his 18 month tenure at the so-called elite college because it contradicts the story of a hard-luck childhood he has allegedly 'spun' to the electorate. 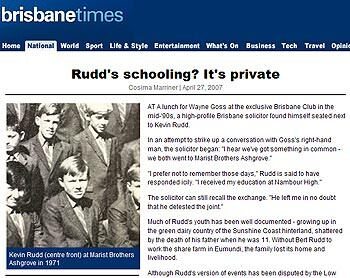 I attended Marist College Ashgrove nearly a decade later than Rudd, as a day student not a boarder. However, my experience does share some similarities to what is documented of Rudd's experience. Both Rudd and I were the youngest children in our families, and we both attended the school in the year succeeding the sudden deaths of our fathers. We both had experience of the dormitory lifestyle of the boarding component of the college, mine as a lay supervisor in the late 1980s, and we both later joined the Australian Labor Party. If the Herald article is correct it may explain Rudd’s apparently indifferent and tepid acknowledgement of his association with the college. The significance of the Ashgrove experience may go beyond any influence it may have had on Rudd’s faith and politics. More importantly, it may have influenced his personal integrity and approach to leadership. It is true that too little is still known of the Opposition Leader. He has assumed the leadership of his party with less parliamentary experience than his predecessor, Mark Latham, whose leadership deficiencies are still raw in the minds of the Australian electorate. The polls — whether or not you put much faith in them — indicate Rudd is only a handful of months away from being our next Prime Minister. Undoubtedly Rudd’s brief period at Ashgrove would have left a strong impression on a young boy still suffering from the loss of his father, but this period is less likely to have caused him to eschew his Catholicism, or forever to have shaped his politics. The Herald article is misleading. Neither by the standards of today nor those of the Rudd era could Marist College Ashgrove be considered an elite school. Rudd would not have been the only son of a share farmer or a nurse boarding at the school at that time. Historically the college has had a broad socio-economic mix of boys attending the school. My best friends in the 70s and 80s reflect this. One friend’s father worked on the wharfs, another owned and developed large tracts of Gold Coast hinterland property. Another one had a father who was a grader operator for the local shire council, and another was the son of a Brisbane public servant. This mixture of backgrounds added to the culture and spirit of the school at that time. It is a stretch to view Rudd’s Ashgrove as being overly dogmatic. The Marist Brothers are a Catholic order of French origin noted for a progressive theology. This theology would have been given renewed vigour in the period after the Second Vatican Council. But yes, it was a quintessentially institutional Catholic school. We had public displays of prayer and worship and a strong devotion to the Virgin Mary. We regularly inscribed JMJ (Jesus, Mary and Joseph) at the top of our workbooks. Rudd’s reflection though, as quoted in the Herald article, that there was a culture which condoned violence, has merit. 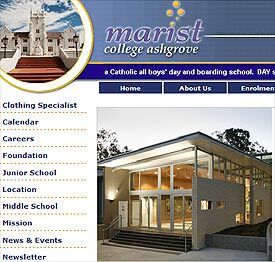 Like many boys’ schools, Catholic or otherwise, not just of the era but both before and after, Marist College Ashgrove could be uncompromisingly and physically tough. It formed its young men according to the motto Viriliter Age interpreted then as 'Be A Man' but recast in post-modern times as 'To Act Courageously'. This would have been intimidating for a shy, non-sportsman grieving a father’s loss at such a crucial stage in his development. Even in my senior year as a school prefect, and with reasonable sporting achievements behind me, I hid the pain of my father’s death from my friends and the school community. I shunned any talk of him and went missing from father/son gatherings. It was not the done thing to display a weakness. On balance, it is hard to see how the college had the pervasive impact on Rudd that the Herald article suggests. Far more probable is the contention the school was not a 'fit' for him at that stage in his, and its, existence. To go searching for darker shadows that do not seem to exist runs the risk of sullying the reputation of a strong Brisbane institution and intruding into a public citizen’s private life. Perhasp Kevin Rudd was the object of persistent bullying - verbal and physical - as I was at MBC, Ashgrove in 1967? Many things have happened at MBC which a lot of students simply do not want to remember or talk about. It wasn't until ten years later (when I was 30) that they finally did. You wouldn't know most of these men went to such schools if you met them in real life but at a gathering one day, I found there was a reason that I had been invited. A psychologist was doing a thesis on this very topic and pulled a few Marist boys together into one room. I admit, I was completely unprepared when it was told to me but a worthwhile experience nevertheless. During my years, I witnessed consistent bullying, sports pressure, a close friend's suicide and other things I care not to go into. I think I heard about arrests being made but I have never looked back. I don't think I met anybody that night who considered their experiences to be healthy. I was forced to attend a northside so-called catholic college for 9 years, not that far from Ashgrove. You know and I know what they were like with the constant sound of the strap being meted out and the hypocrisy emanating from the "men of god". Why don't people just admit and tell the truth about these people and organisations. It's too hard and unpalatable isn't it? My father went to Marist Brothers with Kevin Rudd. Rudd was a couple of years older. He remembers him, and says he had two or three friends, liked debating and chess. He was the nerdy type. where does Rudd figure in the coming New World Order? I was in the same class as Kevin Rudd and he was my friend at Marist Brother Ashgrove . I am pictured sitting to his right in the Photo above. Ashgove was a hot bed of physical and sexual abuse by ' the men of God ' . No wonder he couldn't wait to get out of there .